PLEASE BE SILENT AND DO NOT MOVE ABOUT DURING PERFORMANCES AND ADJUDICATIONS. Please note that, in accordance with our Safeguarding Policy, we cannot be responsible for competitors, who should be accompanied by an adult if under 18. Any concerns should be reported immediately to one of our Personnel, who will be identified by a badge. 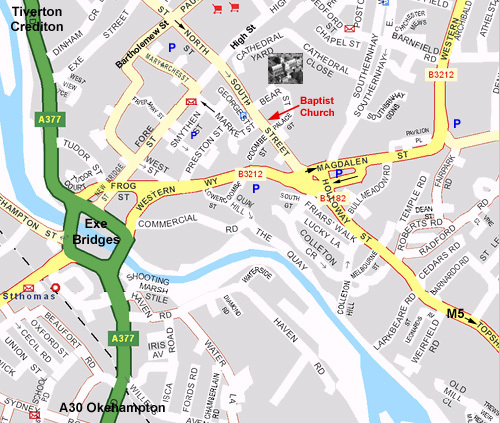 South Street Baptist Church is on the East side of South Street, Exeter, opposite the junction with Market Street. The lower part of South Street is two way, but northbound traffic must turn into Market Street as the higher part of South Street is one-way southbound. By following Market Street across Fore Street, into Mary Arches and Bartholemew Street, it is possible to turn into North Street and return down South Street. The best approach by vehicle is down South Street (southbound) so that the Church is on your left. A little higher up South Street (ie before you reach the Church) there is a parking bay for coaches, and a loading bay a little further down, suitable for pick-up and set-down. For disabled access, it is possible to set-down and pick-up immediately in front of the building. Parking is available in various car parks around the city. David Burley Architects 80 Queens Road Exeter, Licence No AR35094X.